Eating at Koks is unlike any dining experience I’ve had — and I’m not just talking about the food. That is good: there is shiny pink fulmar breast set on dark crimson beetroot, giant rust-brown horse mussels plucked fresh from a Faroese fjord and dulse seaweed combined with blueberries. 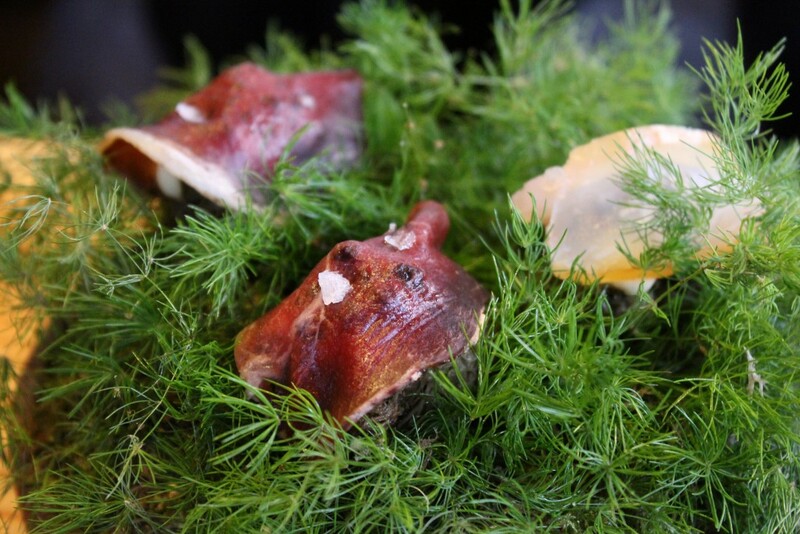 It’s these local ingredients and the way that the chef Poul Andrias Ziska pulls them together that has earned Koks the first Michelin star for any Faroese restaurant. It’s not just about evoking the bracing flavours of these wild north Atlantic islands, where the scenery is of sheer cliffs, rugged basalt hills and moody dark sea. You get those views while you’re eating the food: Koks has just opened in a stunning new location, a twenty minute drive from the Faroese capital, Tórshavn, in the middle of the island of Streymoy. That moody setting means leaving your car at the top of the valley beside a wooden cabin where you are given an appetiser of warm soup and an artisanal beer before being taken by four-wheel drive for the five-minute trip along a farm track to the restaurant. It’s a bumpy mini-safari into an enchanting gorge overlooking a trout lake. The restaurant is built from boulders packed neatly together like a dry-stone wall, faced with traditional wooden cladding and roofed with living turf. It sits at the base of the mountain surrounded by green fields and towering bare hills that define the Faroese landscape. Inside, the room glows with the warmth of natural wood and fluffy sheepskin rugs — a good thing in a country where the temperature rarely reaches above 16C. However, when the sun shines, the flanks of the mountains glisten like verdigris and the lake is a shimmering black mirror. And in summer, here at sixty two degrees north, the day and night virtually become one. Faroese food has not travelled outside the islands. Long isolated by weather and forbidding seas, the islanders have evolved a culture that relies heavily on locally sourced produce: potatoes, a few root vegetables, angelica and rhubarb, but most of all lamb and mutton. Those traditions persist and are a matter of pride among my Faroese friends. The most commonly eaten form of meat is known as ræst, a process of slow fermentation where mutton and lamb carcasses are hung in wooden drying sheds for at least six months until they are covered in a fine bloom of mould. The dried meat is known as skerpikjøt (sounds like shush-per-jot) and has a very strong flavour, something like cheese, and I have always found it a challenge — especially for breakfast. While we in the UK are worrying about gluten, cholesterol, animal fats and “clean eating”, the Faroese cling to their traditional animal-based recipes — and have one of the highest life expectancies in Europe, despite hardly seeing a green vegetable from one year to the next. If I had any doubts about whether traditional food was bad for me, a trip into the mountains with Pol Sundskaro, a local guide, allayed my fears. He turned sixty last year and is as nimble and sure-footed as a Faroese sheep. Olive brown from daily hiking and running, he tells me that he climbed all 340 of the islands’ mountains in six months. Five years ago he ran 186 kilometres in twenty four hours. “I can’t live without being outside every day,” Pol explained as we set off on a hike from the village of Tjørnuvik close to the tip of Streymoy. A black-sand beach fronts the settlement, favoured by a small but dedicated surfing community. The whole place is sandwiched between the flanks of two high escarpments, making it the darkest village in all the islands, with barely a shaft of sunlight making it to the valley floor from late autumn to mid-spring. The path wound up the neck of the valley as Pol led me alongside a small stream until the village was lost to sight. A wide broad valley opened up and after almost an hour we crested the final ridge on to a sweeping plateau. Every now and then I spotted a mountain hare. Pol told me that the hares had been introduced as an extra food resource from Norway in the 1850s. The plateau ended at a cliff edge with the Atlantic a shining cloak of blue laid out clear and calm to the horizon. We were more than six hundred metres above the water and fulmars and skuas cruised on the breeze like white arrows along the cliff face far below. Now that really is a view. TIM ECOTT is a freelance food writer. He contributes to The Times.